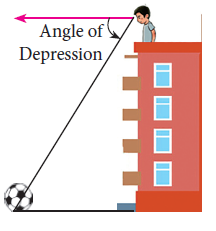 The angle of depression is an angle formed by the line of sight with the horizontal when the point is below the horizontal level. That is, the case when we lower our head to look at the point being viewed. 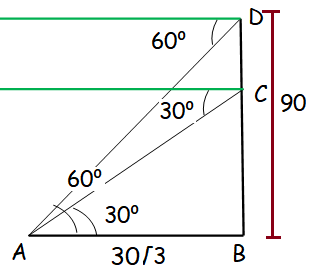 To find questions 1 to 3, please visit the page "Trigonometry Word Problems with Angle of Depression"
From the top of a lighthouse, the angle of depression of two ships on the opposite sides of it are observed to be 30° and 60°. 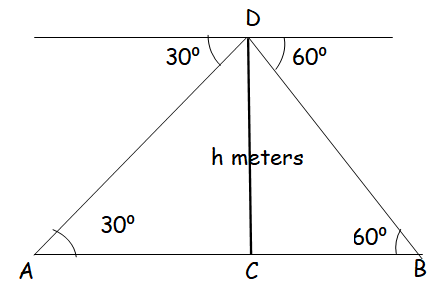 If the height of the lighthouse is h meters and the line joining the ships passes through the foot of the lighthouse, show that the distance between the ships is 4h/√3 m.
A lift in a building of height 90 feet with transparent glass walls is descending from the top of the building. At the top of the building, the angle of depression to a fountain in the garden is 60°. Two minutes later, the angle of depression reduces to 30°. If the fountain is 30√3 feet from the entrance of the lift, find the speed of the lift which is descending. 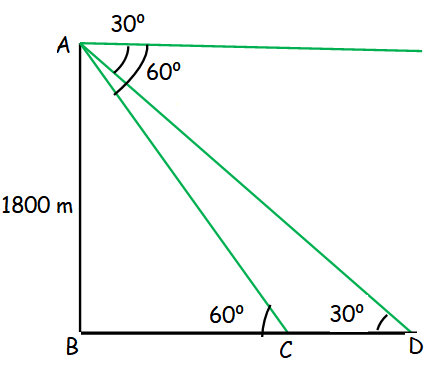 After having gone through the stuff given above, we hope that the students would have understood, "Trigonometry Problems Involving Angle of Depression". Apart from the stuff given in this section "Trigonometry Problems Involving Angle of Depression" if you need any other stuff in math, please use our google custom search here.